Credit card payments are processed by Paypal. Say what you will about Paypal, but it’s easy. You don’t have to have a Paypal account to order, just a debit or credit card. 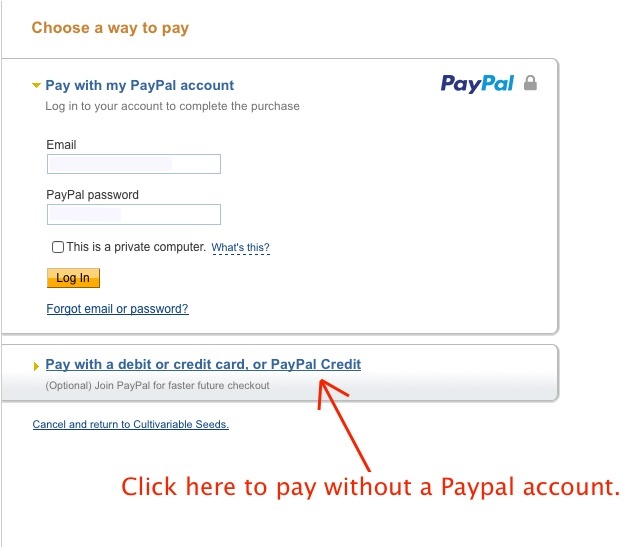 If you don’t have a Paypal account, still proceed with the Paypal option. You will be taken to a screen that has PayPal login information, but also a link for credit card payments. Click on the link in the bottom of the box that says “Pay with a debit or credit card, or Bill Me Later.” You will then be taken to a standard credit card processing screen and will not be required to create a Paypal account. We accept Bitcoin and perhaps additional cryptocurrencies by the time you read this. There is an automatic 5% discount to your order when you pay with Bitcoin. One nice thing about cryptocurrencies is that no payment processor is involved. These corporations are increasingly throwing their weight around and making it hard for people who say things that they don’t like on the Internet. While nobody is likely to try to suppress anything that I have to say, I would like to preserve the freedom of the Internet and taking power away from the corporations that move the money is a good way to do that. So, if you have Bitcoin, we’re happy to take it as payment. I recommend that you supply a Bitcoin address for refunds at checkout, since there is always a chance that we won’t be able to fulfill some items and will need to refund you. It isn’t required though – If you don’t supply an address, then we will email you and work out a refund, if necessary. We are happy to take orders by mail as well. You can pay by check or money order made out to Cultivariable. Checks may take several weeks to clear for some reason, even in the age of electronic banking. If you pay with a money order, please keep your receipt. If we don’t receive it and you don’t have the receipt, you can’t get your money back. We would really prefer that you do not send cash. The problem is that it sometimes disappears and then we are in the awkward position of having to tell you that we didn’t receive it. At the very least, make sure that you get tracking if you send cash. We would prefer that you place your order on line, even if you are mailing payment, but if you don’t want to do that, we will still take orders by mail. Click here for our printable order form: cvorderform.